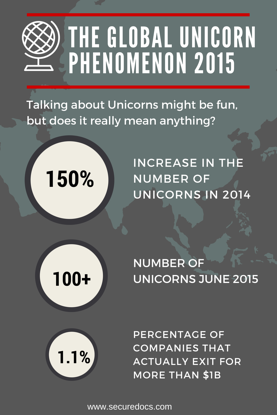 The ‘Age of Unicorns’ is certainly upon us. The number of companies now referred to as ‘Unicorns’, private tech startups with valuations over $1B, is steadily on the rise- a trend that is giving cause for discussions, and even arguments, among tech community leaders and media experts alike. The focus of many such discussions surrounds the incredible dollar amounts attached to these tech giants, some of whom are less than a year old, and whether or not the dollar amounts truly mean anything significant about the technology and its long-term impact, or lack thereof. A controversial point, that begs the question: Will the ‘Age of Unicorns’ pop the tech bubble? or do these numbers really mean anything at all? This elite billion dollar club continues to gain new members on a regular basis thanks to groundbreaking technologies, savvy business skills, and a bull market. Possibly the most astonishing element of this trend is the impressive number of young startups that have not only managed to achieve a valuation of a billion dollars (or more), a feat that in and of itself is impressive for a company at any stage or age, but have done so in only a matter of a few years. According to Fortune’s “Unicorn List” that features an impressive 100+ companies with unicorn status, eleven of those startups have been founded in the last 3 years! Companies like Snapchat-founded in 2012 and valued at $15.08B- and Zenefits- founded in 2013 and valued at $4.5B-have clearly secured their place in history as playing an active part in a phenomenon that was once thought of as an improbable fantasy dreamed up by overzealous entrepreneurs. Fantasy or not, one things is certain; this trend doesn’t seem to be going anywhere. According to CB Insights last year alone there was a 150% increase in the number of private companies with valuations of $1B or more over 2013. 2015 started the year with 38 companies in the billion dollar club, today the list exceeds 100. So, in reality what do these billion dollar valuations really mean? After all, exiting for over a $1B is something that is very difficult to do, and with only 1.1% of exits hitting the mark it seems like the stuff of fairy tales. But, so did a billion dollar valuation for a private startup not too long ago. List last updated on June 4, 2015.